Jennifer Epstein of Politico.com is reporting that Donna Brazile, a former adviser to President Bill Clinton and Al Gore, will fill in as interim chairwoman of the Democratic National Committee until Rep. Debbie Wasserman Schultz of Florida can be officially elected to the post. Brazile will take over the post for the next two weeks to fill the void left by Tim Kaine, who is running for Senate, and the 15 days that Wasserman Schultz must wait before an official vote can be taken. 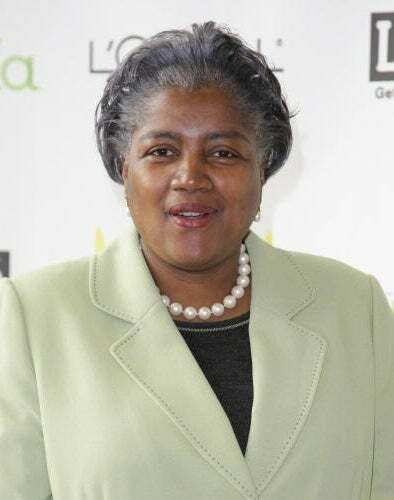 Epstein reports, "I have been a member of the DNC for a while now," Brazile told CNN Wednesday morning (she is a CNN contributor). "I am familiar with the building and the party, and know where everything is. My job will be to keep the lights on, make sure people get paid, keep it running and help conduct the election." Does this move now make Donna Brazile the first woman to hold the position of DNC chair? That would be cool and unexpected. If Brazile can fill the void, why couldn't she fill the post? We're just wondering. CORRECTION: Although it is being widely reported that Debbie Wasserman Shultz will be the first female head of the DNC, there have been two female heads of the DNC before her. The late Jean M. Westwood was the first female head of the DNC in 1972 followed by Debra DeLee in 1995. This would make Wasserman Shultz the third female head of the DNC. We regret the error. In other news: Malcolm X's Daughters Dislike Marable's Book.